Yesterday, I started my stay with a beginner’s walking tour, thinking it is probably the only way to get oriented in a short time. The tour guide was very knowledgeable but skipped over some key milestones. If you only consider the facts no one disputes, it is hard to justify how the Israeli government has treated the Palestinian community here. But I will stop there…. 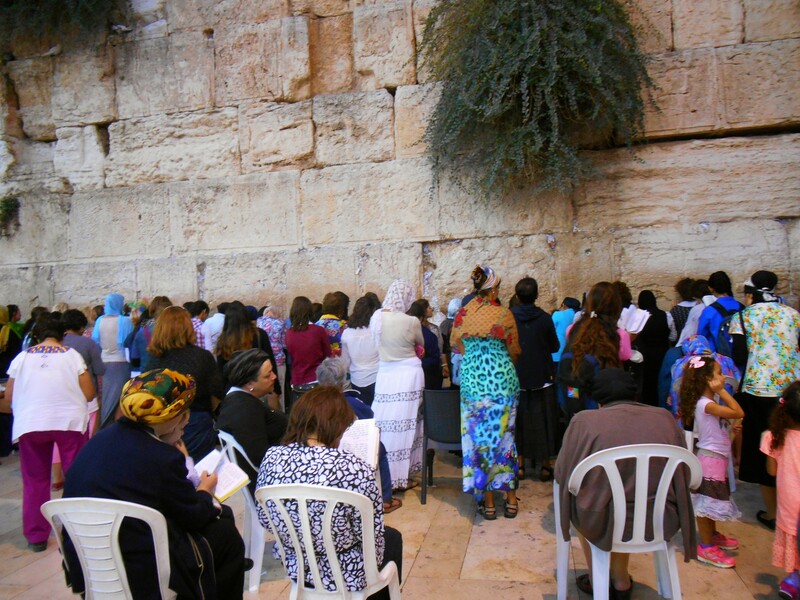 The Western Wall, extremely sacred to Jews, who come to pray and celebrate. 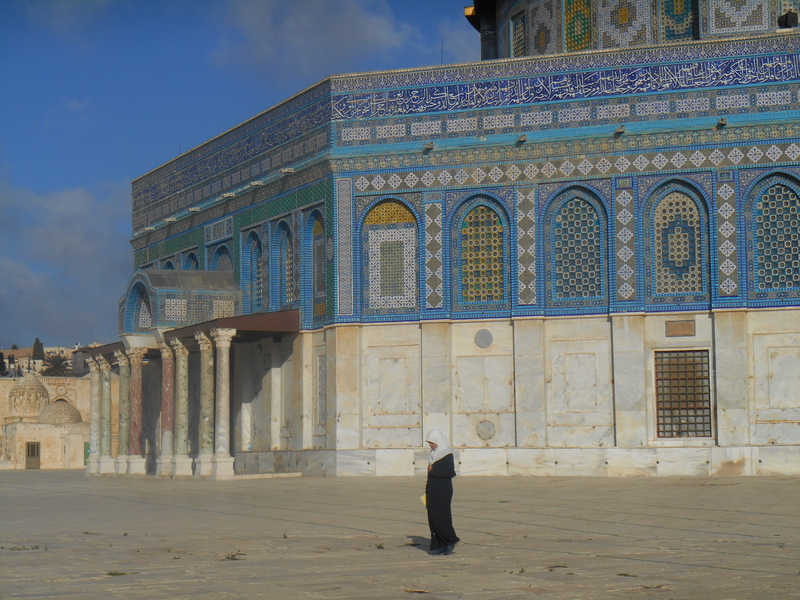 The gold dome on the left is the Dome of the Rock, now a Muslim temple. 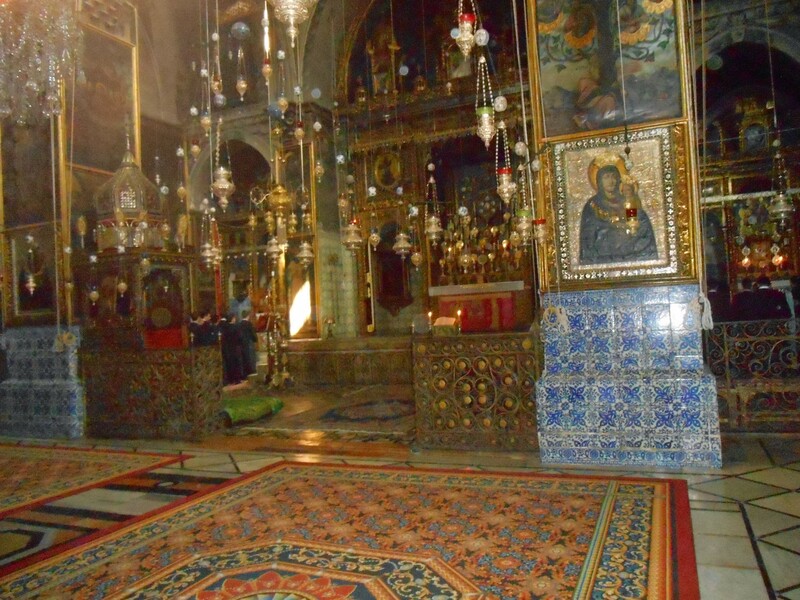 The Church of the Holy Sepulchre. 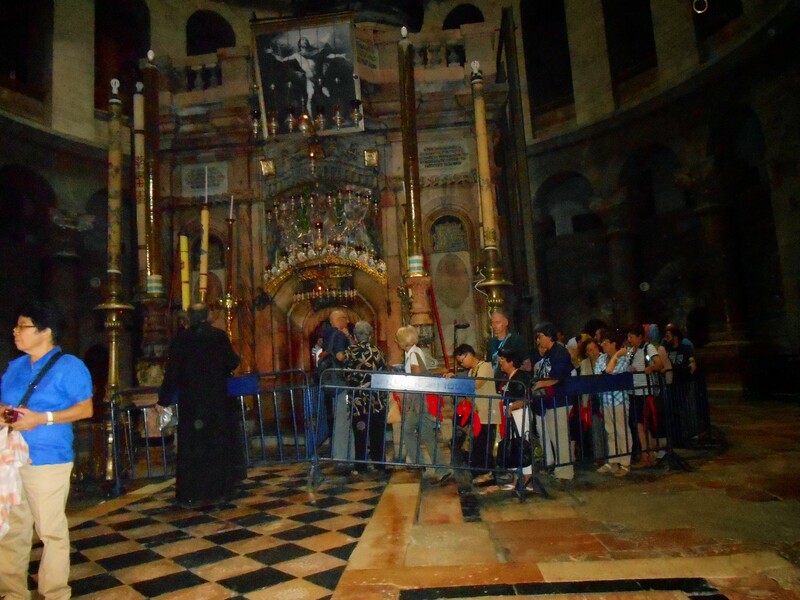 This is the tomb where Jesus would be buried if he hadn’t risen from the dead. 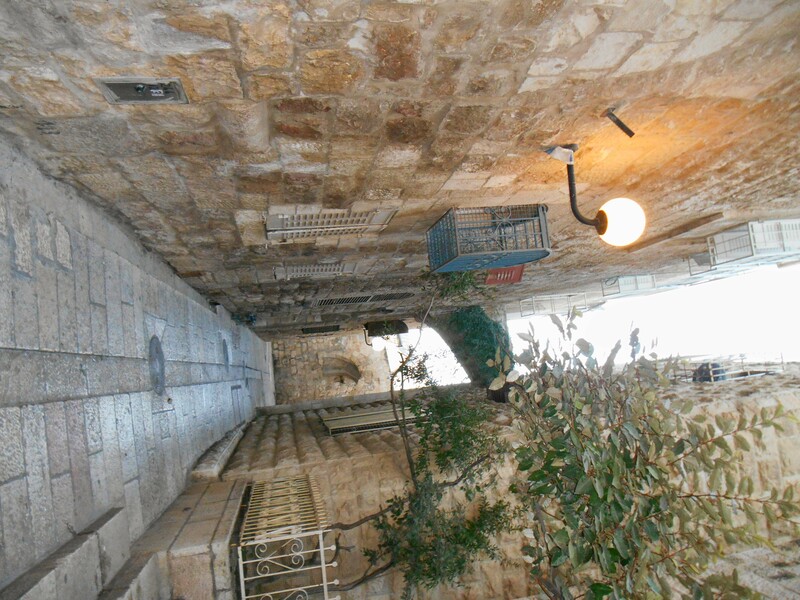 This is the Western Wall up close. Women and men may not worship together. Israeli girls must serve 2-3 years in the military. These girls were so fun and friendly! 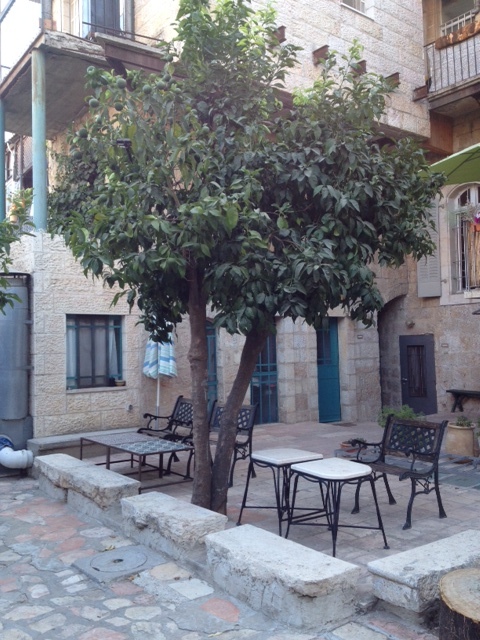 My studio apartment, which is three blocks from the Muslim side of the Old City. Every evening I sit on this patio and eat a falafel with a beer. Today, I went to the Armenian Quarter, which has been here for about 1600 years. Currently, it is a tiny community of about 1500, mostly men and women getting religious training in the convent and the seminary. 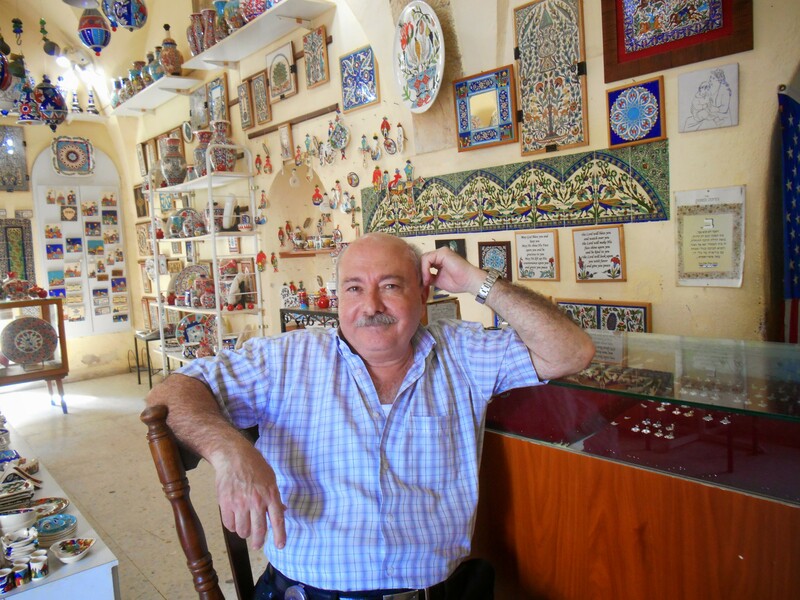 I stopped by one of the few Armenian shops and talked to my new friend Haroud about what to see. He quizzed me on my knowledge of Armenian and I recited the only six words I know — and he told me that “Hosso” is not an Armenian word (Dawn, Kathy, Laura help me out here!) Then I went to Armenian church services, which always begin with the sound of banging on wood because in a past era, the Muslims would not allow the Armenians to announce their religious enthusiasm with bells. I lit a candle for my lost Armenian family and thought about how my dad would have loved Jerusalem. The Armenian church at vespers. The services are in Armenian but sound a lot like Hebrew in their tone and cadence. Haroud gave me a 21% discount on anything I buy because he had to give me a bigger discount than the man in the store who wasn’t as pretty. Unlike most of the Old City, the Armenian Quarter is very quiet and private. 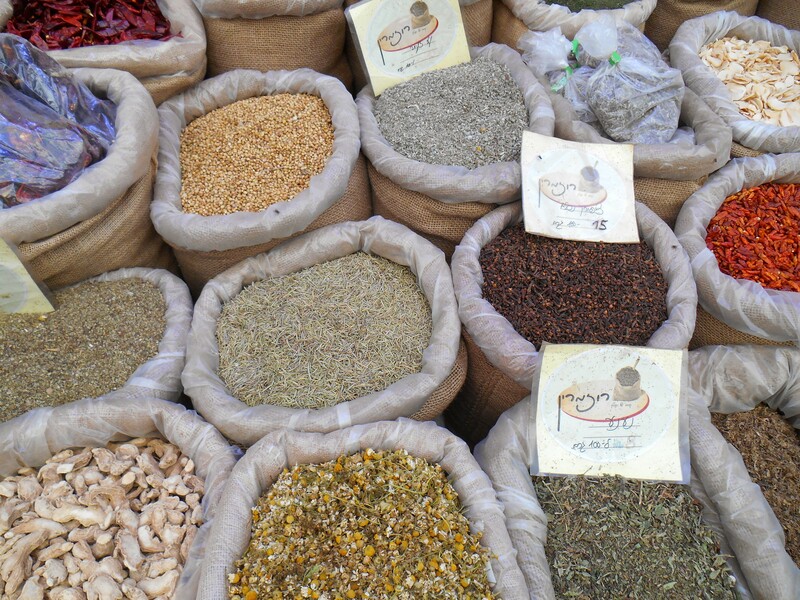 Then I went to the big public market which was jam packed with people buying stuff for Shabbat dinner. I think I am going to have to change some of my travel strategies because I am having a hard time connecting with fellow travelers and I am starting to get a little lonely. I met one woman from New Zealand who is traveling around the world and we had fun talking about Thailand and natural dying processes. But then she decided we were over billed for lunch and ran into the souk with what she thought we shouldn’t have to pay, yelling “I’ll give you back your share, come on!” Any *mature* woman who takes off on her own for months at a time is going to be a little weird — I just need to find someone who is my kind of weird. The sun is going down and I can hear the shofur and the call to prayer. What an amazing City. Wonderful photos Kim full of life and color! And your descriptions are also vivid. Feeling lonely is part of the package you signed up for and I, for one, don’t think you should fight it, but rather relax into it and let the experience envelope and then pass through you. Is that New Age-y enough for you? Alternatively, you could book a flight, come back home and be here tomorrow night for dinner with Gabe and me. You are missed! Thank you for your usual wisdom. following your travels. No need to feel lonely. Hi Stan, non-Muslims cannot go into that temple. Thanks for the encouragement! What an amazing city…what an amazing woman! Lonely is one thing – afraid is another. I’m so happy that you’re only lonely! Love you….”wish I were there”. 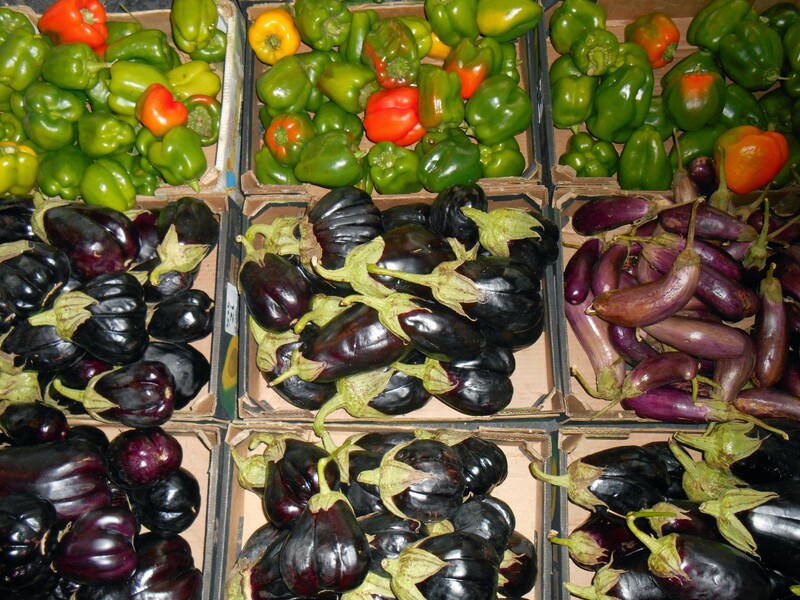 What gorgeous photos, Kim, so colorful and historic and all the food looks and sounds delicious! Liz showed me the cookbook by an Israeli chef in London, Ottolenghi, and I have it now from the library. I’m trying to cook from it, but everything is so labor-intensive. You are lucky to be there! Wow your pictures are amazing! I spent the summer in Israel many moons ago and your pics brought it right back. You should write a travel book when you get home. That woman is a tool. 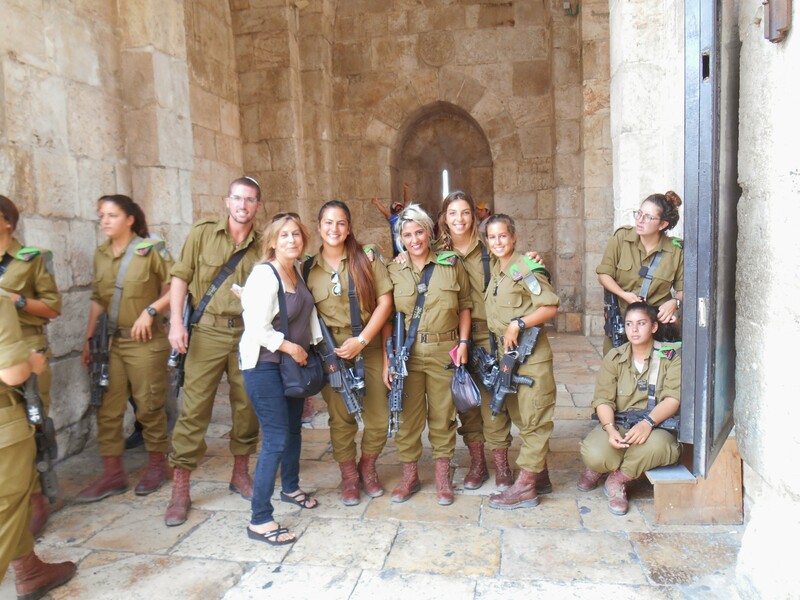 Forgot to asked, why separate service for men and women at the Western Wall? Is there just one God? Does not seem right. So happy that you made it to Israel and that you are enjoying it. Like Leslie, I was there many moons ago. Hopefully you’ve tried more than just felafel. The cuisine has changed greatly since I was there. Ottolenghi is a well known Israeli chef. Also, the shofar (ram’s horn) is blown for Jewish holidays (Yom Kippur, etc.) and not as a call to prayer. You meant that to be 2 separate things I think. Hope you get to see more of Israel..I’m not caught up on your entries. All the best. Hi Maureen. I wish I had found Ottolenghi — I never thought I would get sick of falafels! I finally did find a place that made awesome shakshuka. Sorry my comment was confusing on the shofur. 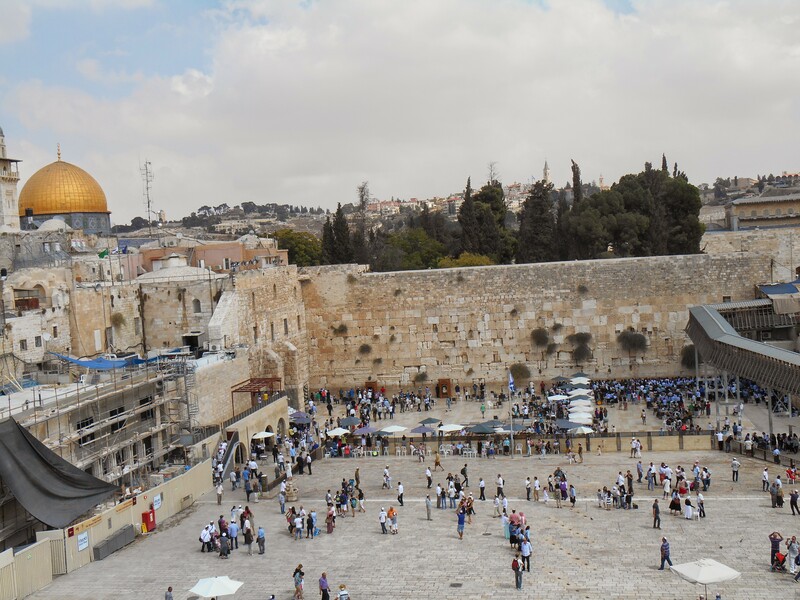 It is sounded in the Old City to mark the beginning of Shabbat and coincidentally it was going at the same time as the call to prayer from the mosque. Kim we are all with you but I know what you mean, meal times are the most difficult. I wonder what the strategy should be to overcome that? Maybe a couple would be more rational and open to someone else to talk to? Especially to someone as interesting and congenial as yourself!